Sorbus hajastana is threatened as a result of forest clearance for development, in particular the expansion of recreational areas in response to growing tourism in Armenia’s higher elevation zones. The species’ long-term survival is assured through the establishment of population-based collections at botanical institutions in Armenia and targeted reinforcement programmes in the wild. 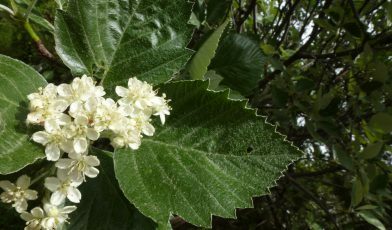 Known from six locations in central Armenia and one area in Georgia, Sorbus hajastana (Rosaceae) is an endemic whitebeam of the southern Caucasus. Growing on rocky slopes and in mountainous meadows at altitudes between 1,600 – 2,400 m, this dainty tree has a manifold of uses such as food (berries) for birds, source of honey and herbal medicine, as well as serves as an ornamental plant. Forest logging for the development of recreational zones and other construction work has reduced the size and vigour of the natural populations in recent years. As a result, this species in now recorded as threatened in Armenia’s and Georgia’s national red lists (Vulnerable – Red Book of Armenia (2010); Endangered – Red List of Georgia (2006; 2014)). Without urgent support, this plant is likely to face further rapid population decline, putting itself and the species dependent upon it in peril. 3) Designing conservation actions in the wild, in particular targeting populations in the Sevan National Park.